2017 was the most destructive and deadly fire season in the state's history. 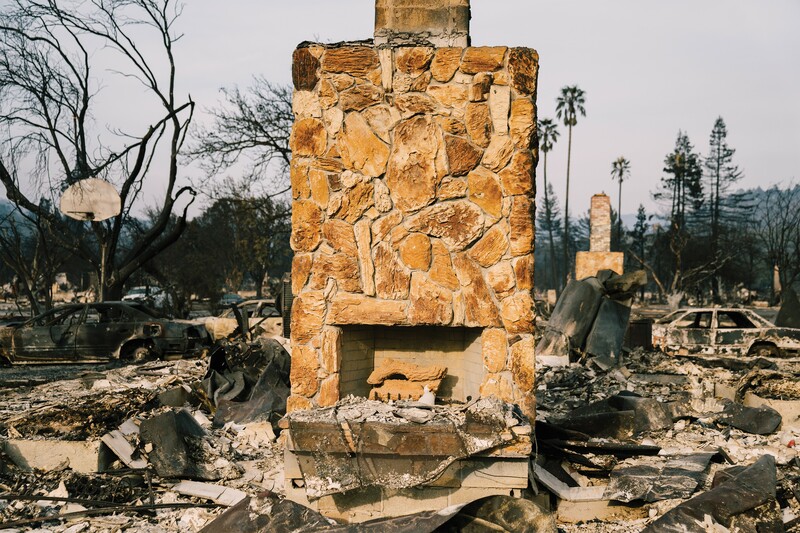 The North Bay fires killed 44 people. Normally, December is a season of cool weather with rain along the coast and snow in the mountains. But this year, white Christmas means a blizzard of ash across Southern California. And as of mid-December, most of the Bay Area was under a fire watch due to a dry spell combined with our region's Diablo winds. It's a disturbingly appropriate end to 2017, a year of destructive fires that began the previous December with Oakland's tragic Ghost Ship inferno. Fires were a constant threat. Just in the East Bay, a halfway house on San Pablo Avenue went up in flames in March, killing four and displacing dozens. Multiple homeless camps were destroyed over the spring and summer, some by arson, others by accident. Three construction sites in Oakland and Emeryville were reduced to smoldering piles of wreckage — arson in two cases, the other one undetermined. And catastrophes were barely averted when firefighters extinguished brushfires in the hills, including a large fire above UC Berkeley in August and another above Leona Quarry in East Oakland in September. The most recent hills blaze on December 12 damaged five homes. Fortunately, the wind was calm. The past year was record breaking in terrible ways — 36 died in the Ghost Ship, surpassing every fire in California since 1906. The wildfires in Sonoma, Napa, Lake, and Mendocino counties killed 44, the deadliest of their kind. They also did more property damage than any fires in state history. According to Cal Fire, in 2017 over 6,877 fires burned a half-million acres across the state. An average year sees a third fewer fires that only consume about 200,000 acres. The scary thing is that while climate change may be setting the state up for a future of drier and deadlier conditions, the past year's record-breaking destruction wasn't necessarily caused by global warming. "We're seeing an increase in wildfires," said Lynne Tolmachoff, chief of public education for Cal Fire. "We're seeing climate change, but California is prone to having droughts, and when we came out of the most recent drought, we had heavy rains — that was fuel for grass fires." Santa Rosa's Assistant Fire Chief Paul Lowenthal agrees. "We had five or so years of drought, and fuels were dead and dried up," he said about the state's forests, like the hills east of his city that erupted in flames in October. "Then, we had this crazy wet winter that resulted in an explosive amount of growth." That new tall grass combined with drought stressed trees and bushes was a tinderbox. So, while climate change will mean a greater fire hazard in the future, it wasn't necessarily responsible for 2017's calamity. This is especially true for urban structure fires. The Ghost Ship and San Pablo Avenue fires, like other smaller commercial and residential blazes that resulted in death and displacement for East Bay residents, were caused by economic, social, and political forces — not global warming. Oakland's old housing stock and commercial buildings are already dangerous. The city's code and fire inspectors have struggled to keep up with routine inspections, and elected officials have allowed this situation to fester for years. Oakland's response to 2017's fires has been mixed. Residents of numerous unpermitted warehouse spaces were evicted following Ghost Ship. After the San Pablo Avenue fire, the city ramped up its proactive code inspections program to make residential housing across the city safer. Fire Chief Darin White said at a League of Women Voters event last month that his department has undertaken numerous steps to improve its fire prevention efforts, but he declined to give specifics. The city remains filled with dilapidated homes and apartment buildings ready to go up in flames. "The greatest toll is exacted from our most marginalized neighbors," said Jonah Strauss of the Oakland Warehouse Coalition. Strauss sprang into action after the Ghost Ship fire to help tenants improve safety in unpermitted living and arts spaces. After the San Pablo fire, he helped raise money for the displaced residents. But Strauss said the city is doing very little to make sure landlords improve safety. "When poor people of color lose their homes, there is no recourse," he said. Oakland firefighters are also critical of the city's efforts. For example, despite having a major port, Oakland lacks a fire boat, said firefighter and IAFF union Vice President Zac Unger. In addition to fighting fires on the waterfront, the boat would also serve as an emergency pump to feed water to crews as far away as the hills through long hose lines. It could be necessary if there's another firestorm in the hills. In 1991, some water mains lost pressure. A boat-to-engine backup pumping system would be a useful option. The city's Wildfire Prevention Assessment District also expired in June of this year, eliminating a key source of tax revenue used to pay for inspections and vegetation reduction in the hills. "The money for the district was used up as of the end of June," said Sue Piper of the Oakland Firesafe Council, a volunteer group. The Firesafe Council lobbied the city to set aside $2 million from the general fund to continue clearing brush in the hills, and to hire five full-time fire inspectors and a fire prevention supervisor. But as of November, the city only had managed to hire the supervisor and one full-time inspector. The understaffing was an ongoing problem during the last 14 years of the district's existence. "They had the money and authorization, but they didn't fill the staff positions," said Piper. And the Oakland Fire Department has yet to complete its vegetation management plan, a roadmap for how to organize and pay for the work of clearing 1,400 acres of city property and 300 miles of roadsides that are covered in flammable grass and brush each year. But it's not all bad news. One thing that is working, locally and statewide, is the mutual aid system. Firefighters from Berkeley were some of the first outside agencies on the scene in Santa Rosa. They saved several homes in Coffey Park and stopped the advance of the Tubbs Fire. Alameda County sheriff's deputies also responded to help evacuate people and secure fire damaged areas while searching for survivors and victims. "It was incredible to see not only the volume of fire personnel but law enforcement personnel that were brought in to help us meet our needs," said Lowenthal about first responder teams that drove up from the Bay Area and beyond to fight fires in Sonoma County. As of early this week, Santa Rosa had three engines in Southern California fighting fires there. Oakland sent an engine, as did Berkeley and other East Bay cities.